I’m resuming again with an article on how to put into practice a exploit that has killed so many victims. I’m doing it simply for increasing the sensitivity of system administrators to the importance of upgrading their systems. Thinking that if the system is not reachable from outside is not necessary to update it is absolutely false. Infact attacking a PC surfing the internet and transforming it into a trojan horse to compromise internal systems is now a well-established practice (see my article about the pivot attack). The effects are very heavy: think to the infame WannaCry malware that has just used the MS17-010 vulnerability for attacking all the system vulnerables found scanning the surrounding network. 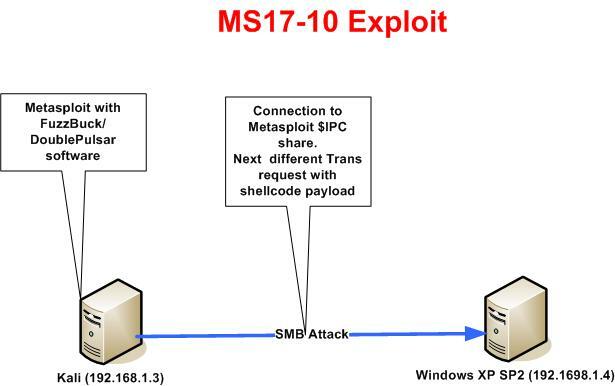 For these reasons I will focus about how to exploit the MS17-010 for compromising a Windows XP with Service Pack 2 not pached using kali and metasploit. A bit of history for better understanding. Earlier this year the ShadowBrokers has published a lot of stuff stolen from the NSA Arsenal (git repository https://github.com/misterch0c/shadowbroker) containing tools and exploit for Windows. One of these esploit called Eternalblue, fixed by the MS17-10 Windows bulletin, permits to take a remote control of any windows system not patched by FUZZBUNCH and Doublepulsar NSA tools (windows tools). Eternalblue is the exploit used in this laboratory for compromising a windows xp system. The windows tools will be running in kali by a window emulator, called wine. The execution of windows tools will be transparent thanks to exploit code for metasploit released by elevenpaths. Before starting with the attack, I will describe all the steps necessary for preparing Kali and Metasploit. FUZZBUNCH coded in Python 2.6 with the need of PyWin32 v2.12. The next step is to clone the git project created by Elevenpath for having the ruby exploit code with all the window binaries and dll of Fuzzbunch and Doublepulsar. Fuzzbunch is a exploit tool like metasploit framework. It exploits the smb vulnerability described in MS17-010 and it creates a backdoor smb pipe used by Doublepulsar for dll injection. Let’s take a look at eternalblue_doublepulsar.rb and you can see that Doublepulsar is run after Fuzzbunch exploited with success. Kali environment is ready for the attack. Let’s see it next. The first step is run msfconsole and verify if the remote system is vulnerable to MS17-10. The victim is vulnerable and then it’s possible to configure the eternalblue_doublepulsar exploit. TARGETARCHITECTURE: this is the architecture of the victim. In my case it’s 64 bit. I will set this to x64. PROCESSINJECT: This is the process where the dll generated by DoublePulsar will be attached. I will set it to explorer.exe. RHOST: this is the victim ip address. target: this is the target SO. In my case windows xp. This exploit will create in automatically a TCP handler in listening, and in the injected DLL there is coded a reverse meterpreter session to kali system. For better understanding how a meterpreter session works read this article https://blog.rapid7.com/2015/03/25/stageless-meterpreter-payloads/. I repeat that my goal was to demonstrate to system administrators how is simple to exploit a system not patched. It’s better to be aware about the risks to witch we meet if we don’t patch the systems and this is the spirit of this article. Share knowledge to be safer. Let me know for any issue or suggestions.